For young adults aged 18 to 35-ish, the Young Adult Fellowship group is the place for creating friendships and developing community together. 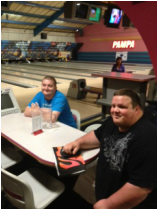 The group gathers for monthly activities including bowling and game nights, service activities and speakers. We are always open to new faces; singles, couples, and friends are welcome! Feel free to bring kids along anytime you need to or speak to the pastor to request child care. For more information on this month's activities, please email the church office at office@firstofwarren.com.